Export to Multiple Sizes is a script for Photoshop to export your work to multiple sizes. 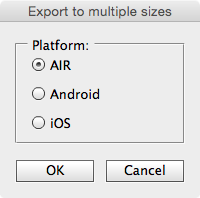 When creating icons for mobile or desktop applications you must export your application icon to over twenty five different sizes. 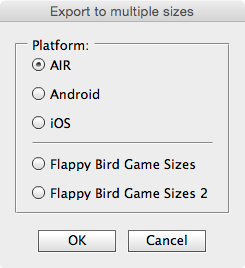 Now you can choose a target platform (or create your own sizes list) and export them all at once! Password Manager allows you to easily create secure passwords. Using anything less than 12 character password is not secure. Short passwords can be hacked within 6-12 hours. Passwords using common words can be hacked even quicker. I wrote this application because creating unique passwords using random letters, numbers and characters of significant length is the most secure way to protect your accounts. Whenever I create a new account for a web site whether it is a social media site or a bank site I open this app and generate a secure password of at least 16 characters in length. With one click I’ve copied a secure, hidden password to the clipboard where it is ready to use. I don’t have to create one myself every time. I don’t have to remember it because the browser will (Firefox) or I can just request a password reset from the site and create a new secure password. * Automatically copies the password you choose to the clipboard. No pressing CTRL + C.
* Automatically obscures the password. Show or hide within the application. Prevent onlookers. Great for use in a public setting. This is now a free download. The download is here. AIR Play is Apple’s software used to stream video or audio to an Apple TV. Occasionally it gets stuck and the video and / or audio doesn’t stream to the device. This software fixes many of those issues. Whenever this occurs I open this app, click the restart button and almost instantly AIR Play is working again. Note! This application restarts core audio similar to going to the command line. If you are comfortable doing that then you do not need this app. This wraps up that functionality and gives you instructions so you can use it whenever you need it. NOTE: This does not work with the new version of OS X 10.11 or greater. A workaround is being worked on. Apple TV can be finicky at times. Sometimes the audio stops working and sometimes it does not connect or it does not see the Apple TV. This tutorial will help you get it working. 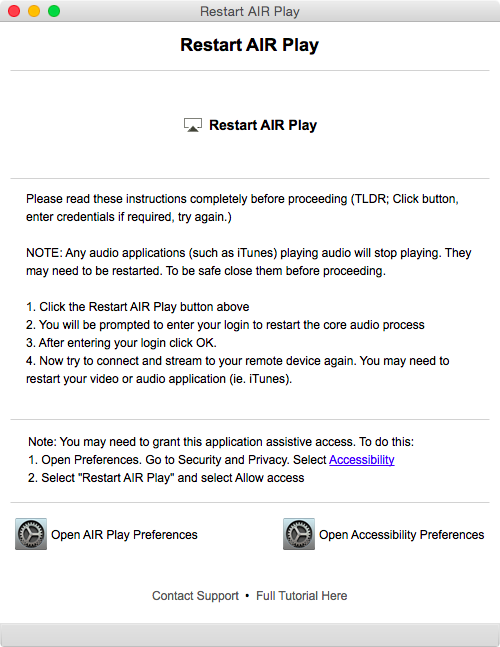 First download Restart AIR Play. TLDR; Click button, enter credentials, restart your video or audio app and try again. NOTE: Any audio applications (such as iTunes) playing audio will stop playing. They may need to be restarted. To be safe close them before proceeding. 1. 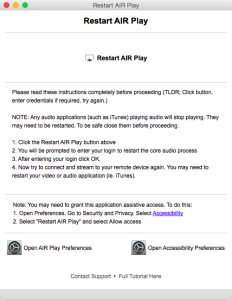 Click the Restart AIR Play button in the Restart AIR Play app. 3. After entering your login click OK.
4. Now try to connect and stream to your remote device again. You may need to restart your video or audio application (iTunes, VLC, QuickTime, etc) and then try to connect again to Apple TV again. Show Desktop is an application for easily showing your desktop. All you do is click the icon and all the visible applications are minimized giving you a clear view of your icons. This app helps you see your desktop quickly and easily. I use it all the time myself.